Papers, Pencils and Books, Oh My! Today was PE, and we were outside for cross country skiing. My partner teacher took half the group skiing, and I kept the other half playing games. The first game we played today was Red Rover. Only 2 students had to make it more physical by ramming into each other with too much force. The other game was the food chain game. It's pretty basic. Take some clothes pins, I had 10 only this time. 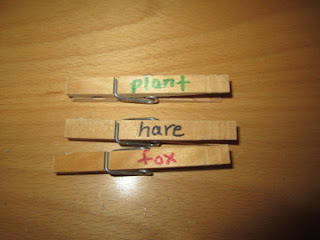 On 4 of them I wrote "plant", on another 4 I wrote "hare" and the last 2 were "fox". I handed out the clothes pins by pinning them on the students jackets. Then everyone had to face the same direction at home base (no peeking), so I could release the plants into hiding. The rule is, if you are a plant, you go hide somewhere in the yard, but you cannot move from your spot. Plants can't get up and move. Then I released the hares. Their job is to go find the plants (no tag necessary) and take the clothes pin off the "plant" student and attach it to their own jacket. Now the hares must hid because the foxes are soon on the loose. Hares can hide and move. The foxes were then released. When they find a hare, they take both the hare pin and the plant pin, and pin them to their own jacket. Today we played in a small area, but it can be more fun when there are more hiding spots. Once a student has their pin taken from them, they return to home base and wait so the next round can begin. I then told students to switch pins and choose one they were not before. I am going to make more of them for my students, so they can play during the recesses. Here in Finland this is a food chain that exists in our natural environment. Perhaps you can come up with a food chain with animals that would exist in your surroundings! I'd be delighted to hear if you come up with one. First I'm a wife and mom of two great girls. Then I'm a elementary teacher. I have been rotating from 1st to 2nd. This autumn I get a new lot of first grade cuties. I am a Finnish-American. Born and raised in the states, and now I am living in Finland with my fab family. Thanks for stopping by! Cyber Sale TpT 12/2 - 12/3!